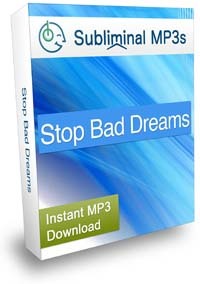 Stop bad dreams from occurring with the help of our subliminal mp3s and get a peaceful night sleep. Do you hate going to sleep at night because you're afraid of having a bad dream? Do you tend to have bad dreams that occur over and over again...night after night? Do you go to bed hoping you won't have yet another nightmare? Do you end up feeling stressed during the day due to lack of sleep because bad dreams keep waking you up in the middle of the night? All dreams originate from your subconscious mind and are typically a combination of whatever happened during your day, worries over things in your life or even events from your past. When you go to sleep with all of this stuff on your mind, your subconscious tries to sort everything out. The problem is the same thoughts and worries are still active and can turn into disturbing images or bad dreams, and if you don’t take any action to clear out your subconscious mind, and change the way your dreaming mind deciphers information then you will continue to suffer from nightmares. 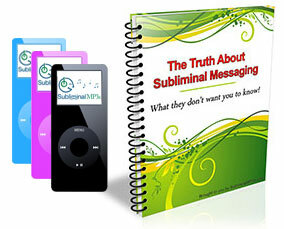 Because everything originates in your subconscious mind, subliminal messages can be a great tool for reprogramming your dreams. They will send positive information into your subconscious mind so that you are flooded with happy thoughts, positive feelings and good emotions - making you much less likely to have a nightmare, or a bad dream. On a deep level they will change the way your subconscious mind decodes information from your day and will stop you from having recurring bad dreams and nightmares. You will actually be able to look forward to sleeping at night and not be afraid of having bad dreams. This isn’t just a fantasy. If you can change on a deeper subconscious level then you really can stop your nightmares at the source and change your dreams forever! Listen every night as you fall asleep and soon you will leave those bad dreams behind! Download this mp3 today to stop bad dreams at the source and claim your life back from night terrors! As your dreams start to improve then our remember your dreams subliminal can be a great album to help you remember all of those new positive dreams!